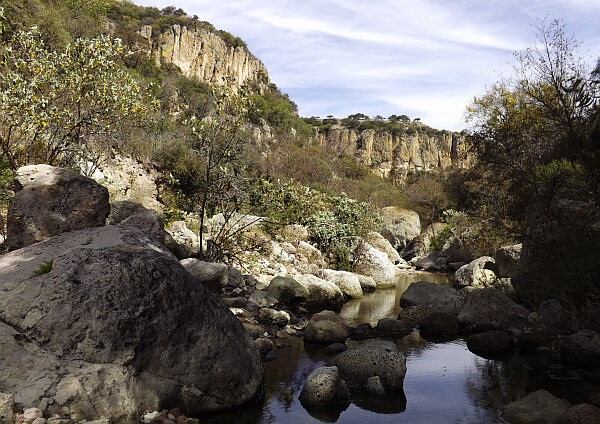 With local tour operator Coyote Canyon Adventures as a guide, a family explores what lies beyond the churches and cobblestone streets of central San Miguel de Allende in Mexico. San Miguel de Allende wins plenty of accolades for its immaculate Spanish colonial streets, its grand European church in the square, and the array of good restaurants and shops. You can hit all that in a day though, and then what? Even in the nicest environment, days on end of strolling and dining can feel routine in short order. 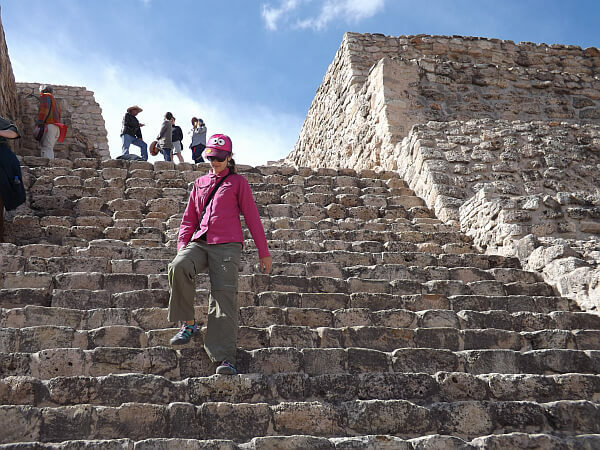 So when I wanted to explore more of San Miguel on a family vacation trip, I hooked up with Coyote Canyon Adventures to get a wider view of what the city can offer. After breakfast downstairs from our room at Hotel Matilda, we hopped into a van with Albert T. Coffee, the preeminent expert on a fantastic archaeological site just 20 minutes outside of town. When Cañada de la Virgen pyramid was excavated, it caused the whole map of Meso–America to change shape. Also, once the archeologists started discovering how the structures lined up with the moon and planets, it became obvious that the Maya were not the only ones that understood astronomy. The local tribes that settled in this area were equally clued into the cosmos. 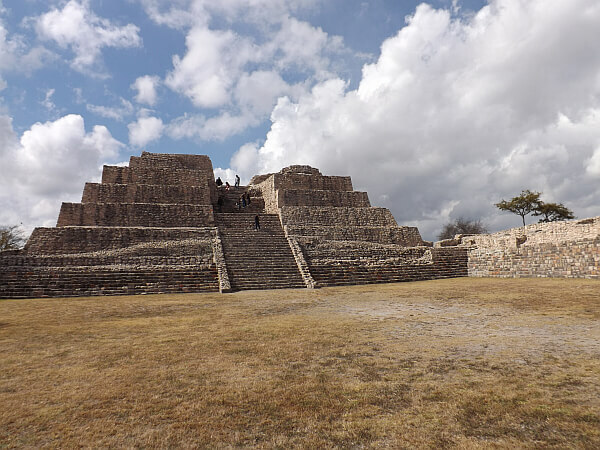 This pyramid and a few others in the region are not Mayan nor Aztec, rather they were built by various groups like the Toltec, Chichimec, and Otomi. The site&apos;s key period of activity was from 540 AD to around 1050 AD. Then it got much drier in the area for a while and warring tribes fought for survival. There are a lot of strange aspects to this site. A circular structure here faces the celestial north, where the stars spin around in a circle throughout the year. The moon moves up the stairs of the pyramid as its cycle advances. It rises and falls perfectly in pyramid notches at key times in the lunar calendar and during solstice periods it turns out that the planets are lined up as well. As with the other Meso–American pyramids, all the structures here were built without any wheels or animals who could carry the giant boulders from quarries. The modern history of this site is almost as mysterious as the ancient one. A wealthy German expatriate bought the 18,000–acre ex–hacienda in the 1990s — supposedly the largest ex–hacienda in Mexico — and it took many years of negotiation for the government to work out public access to "her" pyramid. Now the site is a public island in the middle of private land. We have to board a shuttle bus from a visitors&apos; center to a spot near the site, walk uphill to it along a road, then enter through a gate in a fence that encloses the government land. Because of this odd situation, and the owner only allowing access because she&apos;s forced to, the place is seldom crowded. The downside is you can&apos;t come at night when the real magic happens with the moon and stars. Also, if you don&apos;t book a tour with the right people, you&apos;ll get a random Spanish–speaking guide who doesn&apos;t really have a lot of knowledge. Instead, with expert archaeologist Albert at our sides, we gain in–depth knowledge of what we know and don&apos;t know about the various sites and structures. Much of it is still a mystery, which invites all kinds of theories, from the plausible to the crackpot, as to how this place was built so precisely so long ago. At the end we stopped at a small museum nearby, the Astronomia Prehispanica Museo. 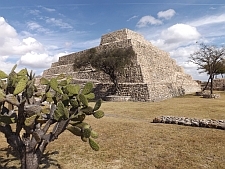 It was established by another archeologist who is an expert on the area: Rossana Quiroz Ennis. The museum has some great photos of the moon&apos;s relationship with the structures here, taken at various times of the year, by people who did have night access. Stopping here gives us another view into a fascinating site. The next morning we had planned to take a hot air balloon ride over the city of San Miguel at dawn. High winds and low cloud cover nixed that idea though, so we got an extra hour of sleep before riding out to a ranch to be cowboys for a day. Soon after arriving, my wife and I took a shot at milking a cow. (My teenage daughter was having nothing to do with that). We then washed up and had a hearty breakfast to get ready for the ride, including some fresh ranchero cheese made from the milk of the very cows we were pulling from, as well as free range eggs from the chickens running around. Coyote Canyon Adventures&apos; founder, Rodrigo Landeros, met us there for a send–off, but he was in the midst of a four–day ride with another group, so we bid him goodbye. Rodrigo founded the company with a local partner when we was living in San Miguel but was about to head back to the USA as his money was running out. He met a local ranch owner as he and his wife were taking one last hike in this area with their young child. 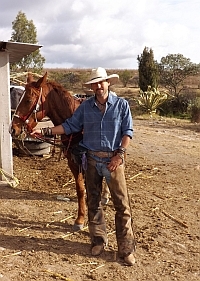 Rodrigo asked the man if he could bring some other people out here and pay the rancher to ride his horses. "Why would people pay money to ride horses?" the rancher asked, skeptical. Soon Rodrigo was bringing guests out to this beautiful countryside every week or two and a real business was born, in the year 2000. The docile horses that would take us into the countryside trotted off after we saddled up, our guides being a transplanted French woman Marie and one of the resident cowboys. We moved through cacti and thorny bushes before descending down into the canyon. At the bottom we rode through the water across a river and took in the gorgeous view under a sunny blue sky. At times the terrain was daunting for us novice riders, on steep trails with loose rocks. "Remember, they have four legs," Marie reminded us as my wife gave out a shriek when her horse stumbled. "Just trust your horse to find its way." We moved along the river bank, each turn presenting another impressive vista. 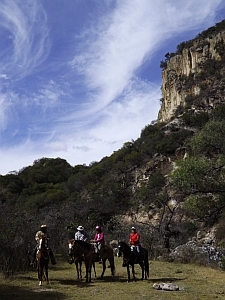 It&apos;s hard to believe this countryside is such a short jaunt from central Mexico&apos;s main tourist town. We stopped at one spot to see geodes scattered among the rocks, quartz and colorful crystals reflecting the sunlight. Occasionally we would pick up what looked like just another round rock and bust it against a boulder. Inside would be a miniature city of crystals sticking out from the edge like colored skyscrapers.